From the very beginning, we specifically designed Jellybox to be a great learning tool! 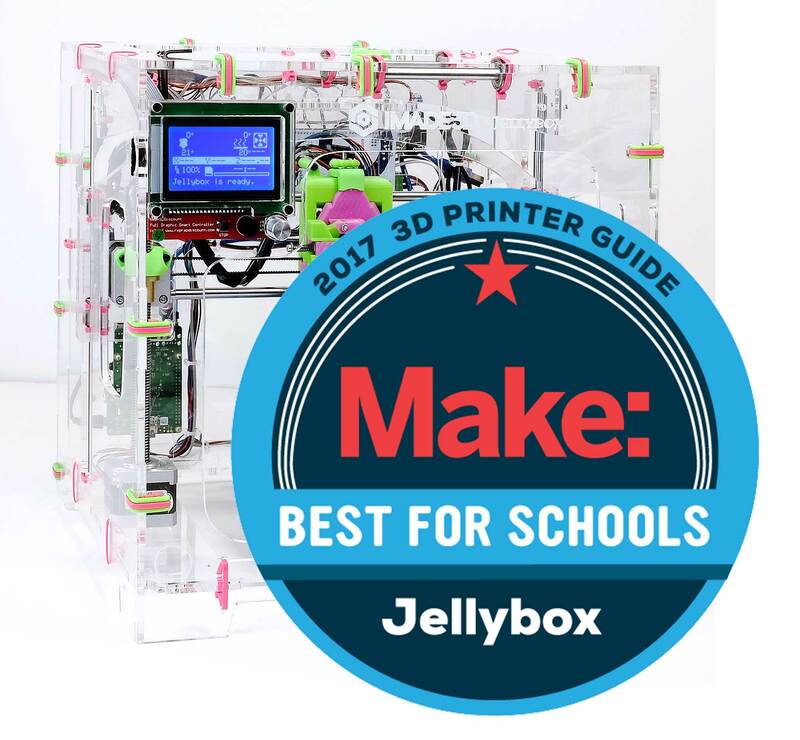 JellyBOX has been awarded “Best For Schools” in the Make Magazine’s 3D Printer Guide for 2017! We are humbled and excited by this amazing award. This is our first year on the market, and JellyBOX 1.0 has already been proclaimed 1st Best in the Educational Category, and 10th Best 3D Printer Overall. This surpasses our wildest dreams! It’s elevating and gratifying to see that our passionate contribution to the 3D printing education gets recognized and validated this fast. The speed and reliability are definitely features that should attract any educator looking for a DIY 3D printer. I went into it thinking the printer was cute and maybe a novelty, I came out thinking this was a printer not to be ignored and a darn fine one at that. The Jellybox had an amazing underdog story at the DigiFab Testing Shootout. I think the initial interest was due to morbid curiosity, “is this thing with zip ties really going to work?” and then shifted to fandom as the Jellybox printed with amazing speed and reliability. JellyBOX impressed me with its ease of use and fast printing. The software install was quick and the auto-level probe meant I was ready to print as soon as I had sliced my first file. From the clear acrylic sides to the exposed wires, everything about the JellyBOX screams “look at me.” They managed to combine the perceived safety of an enclosure with the benefit of seeing how the printer works. The printer is assembled using zip ties, so it’s easy to imagine a scenario where a class builds the printer in the beginning of a semester and then uses it the rest of the semester. At the end of the semester, it is disassembled for the next class to build again. Jellybox is fast to build, but even faster to break down! This means that with a couple of Jellyboxes, you can give the experience of hand-on build to many groups of students! Just take the machines apart when you’re finished. It only takes a couple of zip ties snipped. Building the machine gives students a sense of accomplishment unmatched by simply using a pre-made device. Constructionism alive and well! There’s no better way to get to understand how a 3D printer works than building one! Students develop a sense of familiarity and attachment. This makes them more likely to experiment with the technology and use use it as a flexible tool rather than a prescribed set of procedures. It’s a simple, relevant, and imminently useful robotics project: even kids never interested in mechatronics can understand the appeal. Make all the intimidation factor of cool and complicated technology that tie students down go away. Marriage of STEM and STEAM approaches. 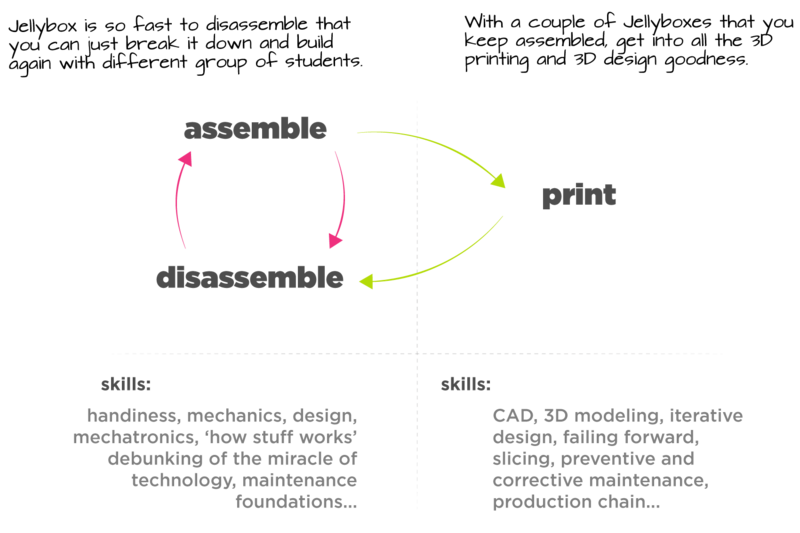 Let the student experience both sides of the equation with both the mechanical build and the more abstract 3D design learning (-> and bring it home by making the abstraction real again by 3D printing it). Are You a Teacher or a School Administrator? Interested in organizing a 3D Printer Build at your school, becoming a 3D Printing Hub, 3D Printing Professional Development or 3d printing in schools in general?